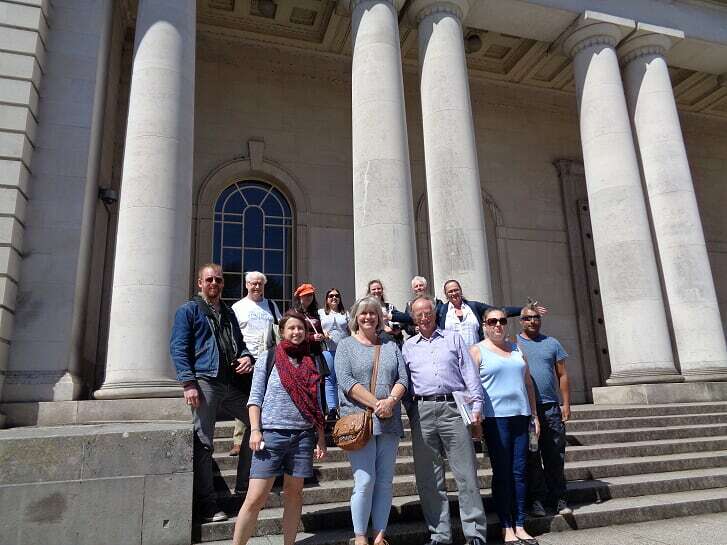 In collaboration with CAER Heritage, a recent six-week course, Hidden Histories of Caerau and Ely was established by Cardiff University’s innovative Live Local Learn Local programme which delivers free accredited courses in communities facing social and economic challenges. CAER Heritage have embedded a whole range of these brilliant courses into our activities over the past 5 years, including archaeological field work, post excavation analysis and exploring the modern history of the area. The new course was taken up enthusiastically by five members of the community along with several participants from further afield too, opening up new friendships and networks. They all had a rare opportunity to visit the vaults of the National Museum of Wales guided by Evan, the senior curator of archaeology at the Museum, and to get valuable training in designing and executing museum exhibitions with Jordan, the learning and outreach officer at The Cardiff Story Museum. 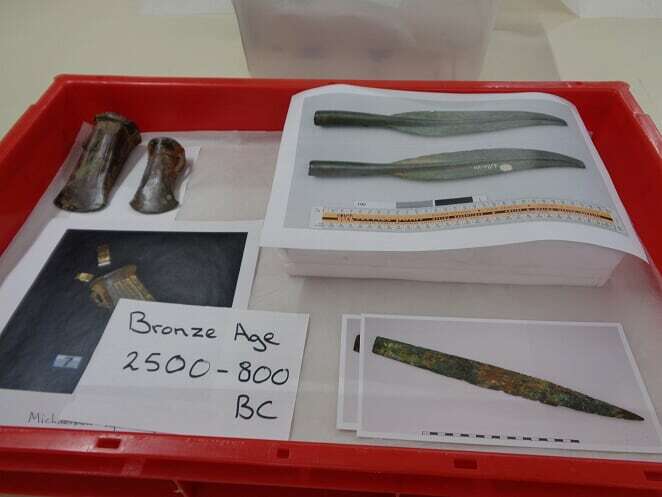 The participants chose a selection of exciting artefacts that have been found in Caerau and Ely, from the Neolithic to the Middle Ages, each one sparking something in their imagination. 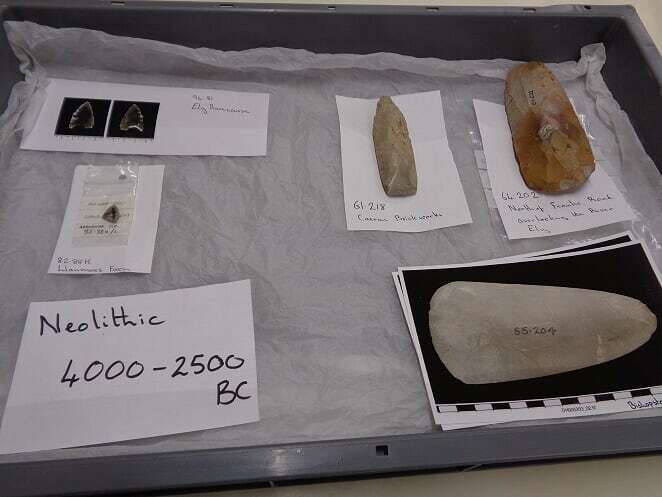 Many participants were already interested in history in general: one was experienced in research but had never looked at artefacts in detail before, preferring to visit sites – he was excited to rise to the challenge of researching materials and the use of individual artefacts. Another, who was already interested in the Middle Ages chose the bridle boss because it was such a decorative, tactile piece, and it fascinated her. 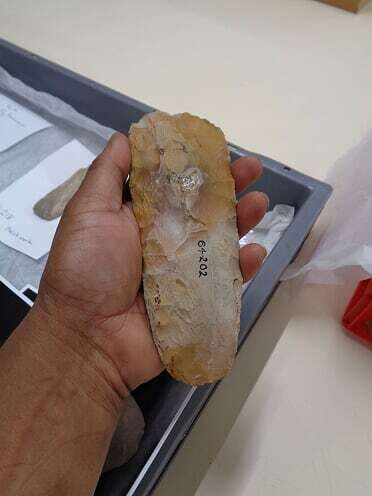 Other participants merged their hobbies with their research: one chose the Roman mortarium sherd – described as a kind of Roman food processor – because of her love of cookery. Finding an everyday kitchen object from the Roman Villa in Ely, where she used to play as a child, really inspired her. As with all previous CAER Heritage Live Local Learn Local courses, through their efforts the participants not only learned new skills they also created new knowledge! Their research on the objects and their respective time periods will be featured in a week-long exhibition at the Cardiff Story Museum over the October half-term – so you can experience the fruits of their labour first hand. Live Local Learn Local courses are aimed at engaging adults who may be facing a whole range of challenges. 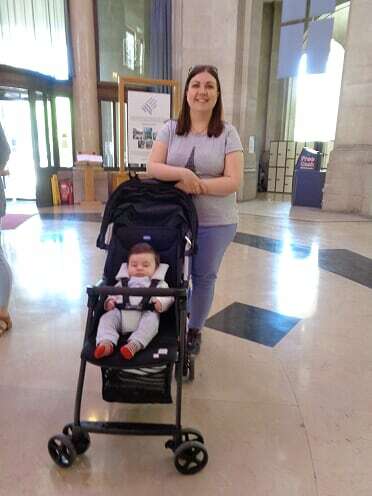 Indeed, one participant described the course as ‘a bit of a lifeline’, as her son, only a few months old, was able to come along to all the classes and could be accommodated easily on the trips. The others loved having him there too, and banded together to help carry the buggy up and down steps when access was restricted, and took it in turns to entertain him during the breaks! 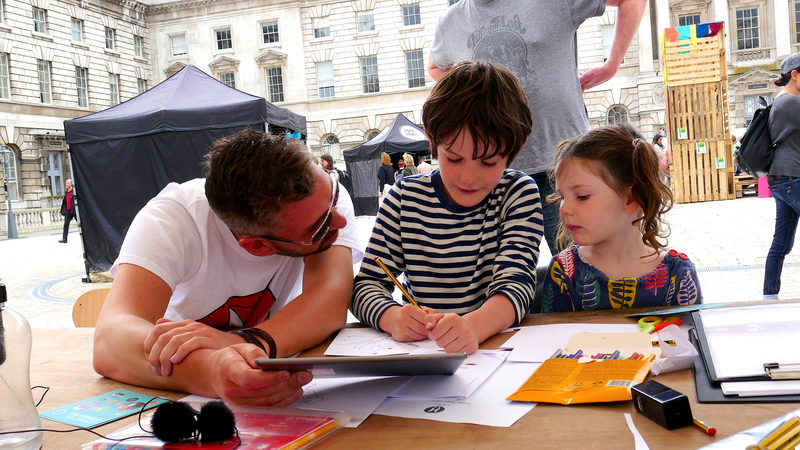 You’re never to young to engage with the past! The participants made friends on the course, and reported higher levels of confidence in their skills as they grew together, supporting and challenging each other over the six weeks. 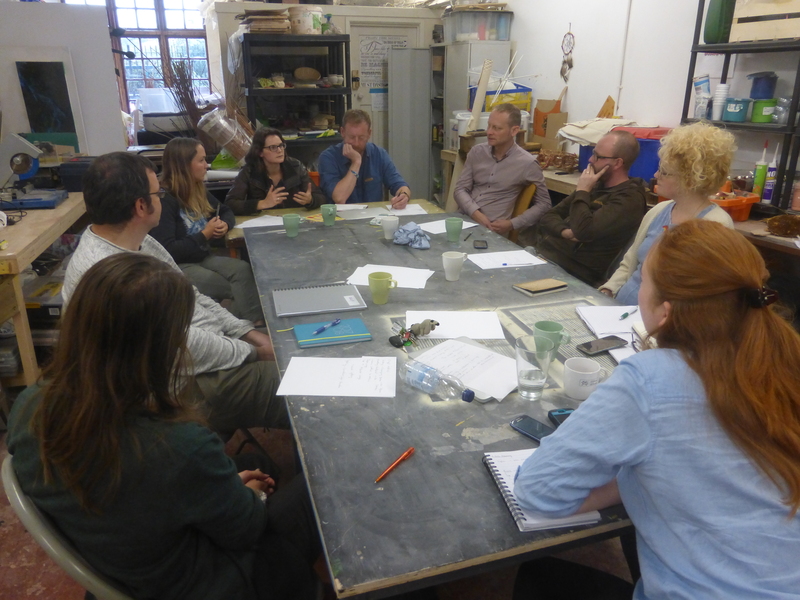 Alongside collaboration with national and local heritage institutions, it was also very exciting to also have the artists from the CAER Studio project involved in the course. They came with us on the museum field trips and sat in on the classes, modelling clay and sketching during class discussions – inspiring the participants to be creative in their interpretations of the objects. One student submitted a children’s story as their final piece of work, based on the artefact they were most interested in, and made contact with an illustrator through the project. The participant’s research will not only be exhibited, it will also be posted online to People’s Collection Wales via the CAER Heritage Project account, so that the digital version of their exhibition will be available online, for free, to an international audience of all ages. The exhibition itself, starring the 6-7 objects selected from over 6,000 years of Caerau and Ely’s heritage and chosen by the students with their accompanying research will be in the main gallery at Cardiff Story Museum over half-term in October (29 Oct – 2 Nov). Don’t miss it! All photos courtesy of Rajinder Singh Gill. On Friday 13th November four artists from the ACE Breaking the Mould: Hands On Art At Our Place project met up with members of the management team of the new HLF funded Hidden Hillfort project, and CAER Heritage Project artist Paul Evans for a day of intensive creative co-production. Based around a series of exercises devised by Paul to put everyone at ease and to create a comfortable atmosphere for a free exchange of ideas, the day was amazingly productive and generated over 150 ideas for heritage interpretation that will feed into the development of the new centre that will be sited in the former Gospel Hall, Church road Caerau. Of course 150 ideas is a lot to fit into one relatively small place so everyone’s suggestions were then subjected to some practical reasoning and trimmed down and organised around four key themes of Materials, Storytelling, Community & Co-production, Inside and Outside (i.e. how we might bring the hill fort into the heritage centre – and how we might bring ideas from the heritage centre up onto the hill). The team also found time to discuss ideas for a heritage themed event will take place at the former Gospel Hall sometime around Christmas. There will be more news about this soon so keep your eyes on our Facebook Page, on Twitter – and WATCH THIS SPACE! We would like to thank everyone who took part on the day and contributed so much of their time, energy and creative thought: artists Imogen Higgins, Becci Holmes (see also In Rainbows), Nicola Parsons, and Dylan Sutton, Breaking the Mould coordinator Becky Matyus, members of the Hidden Hillfort project team – Dave Horton (ACE) Kimberley Jones (ACE), Dave Wyatt (Cardiff University), Oliver Davis (Cardiff University) – and CAER Heritage Project artist Paul Evans. 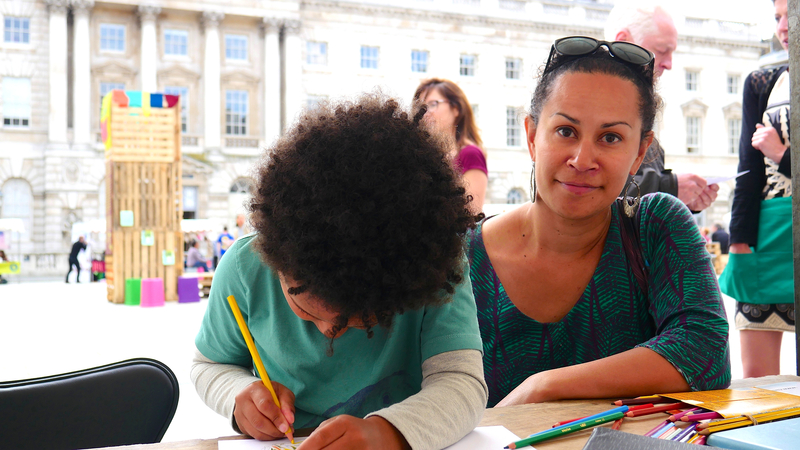 In June 2016 CAER Heritage Project lead artist Paul Evans and local film maker Viv Thomas visited the Utopia Fair at Somerset House in London. Presented in partnership with the Arts and Humanities Research Council (AHRC) and the Connected Communities programme, the Utopia Fair showcased the creative outcomes from 25 AHRC-funded projects, including the CAER Model Village Project. All of these projects have worked to bring together local community groups, researchers, activists and artists across the UK to explore how utopian ideals can be used to benefit the environmental and social future of these communities. Our next door neighbour at the fair was The Middlefield Dig. The Middlefield Dig in Gainsborough, Lincolnshire is part of a project called Middlefield’s Utopia – finding out about the history of the estate with people who live there. The project is organised by Professor Carenza Lewis and Dr Ian Waites at the University of Lincoln. 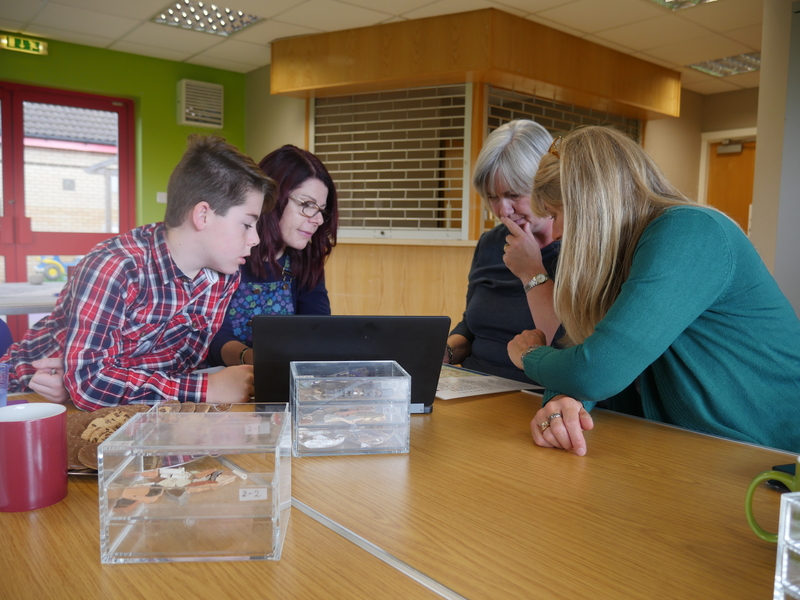 The project team has worked with residents and volunteers in Gainsborough to conduct archaeological excavations on and around the Middlefield estate, to find out about its recent history, and to discover history going further back in time. During a series of conversations between Paul, Viv and Carenza, it became obvious that these two projects have a lot in common: both projects are based on strong principles of community co-production, both are based within estates that were designed on utopian ‘garden city’ principles (originally developed in Radburn, New Jersey by Clarence Stein and Henry Wright) and above all both Caerau and Ely and Middlefield are wonderful, vibrant communities. Although separated by a straight line distance of 268.78km or 167.01 miles, the aim of Unearthing Utopia is to create a short film that celebrates the connections between these two projects and between these two sites. In order to create this film we have run two workshops on separate days in Cardiff and Gainsborough – both workshops were devised and led by Paul and have been expertly filmed by Viv. The Cardiff workshop (see photo above) was attended by members of the local community along with Oliver Davis and Kimberley Jones. Carenza travelled down from Lincoln for the day and we all had an amazingly productive time at Our Place: Dusty Forge, sharing stories and working on scripts based on questions that were designed to draw out comparisons between these two remarkably similar projects. These scripts were then used as the basis for a series of informal interviews that were filmed by Viv. Cardiff v* Gainsborough – the return match! The Gainsborough Workshop was attended by community members from the Middlefield estate along with Carenza Lewis and Ian Waites, an art historian from Lincoln University who grew up on the estate. Viv travelled up from Cardiff to film the event and we were met in Gainsborough by Helen McCarthy, an active member of the CAER Heritage Project team – now well versed in the art of conducting interviews! Paul led a mirror image creative workshop, helping participants to generate scripts in preparation for their filmed interviews, and to take part in mapping/timeline activities that aimed to capture memories of growing up on the estate and their experiences during The Middlefield Dig. It was another remarkable day of sharing experiences and building new friendships! The film is now in the editing stage and will be ready for viewing some time in the next couple of months – check back soon for an update on this exciting collaborative project. 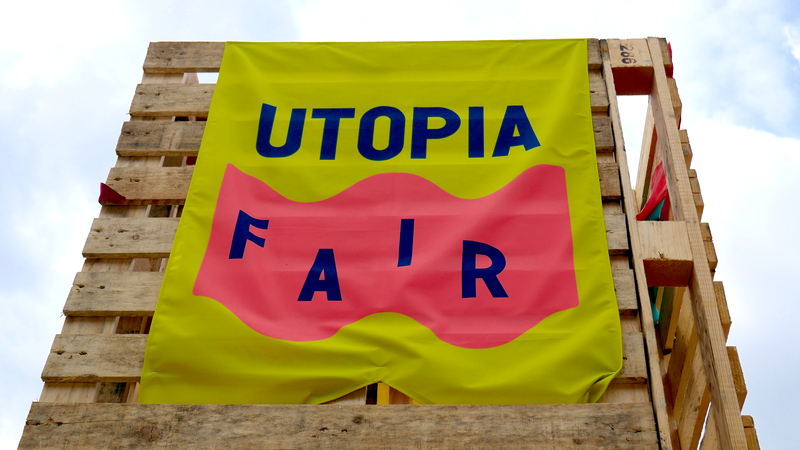 On 24-26th June 2016 CAER Heritage Project Lead artist Paul Evans, artist and film maker Jon Harrison, local film maker Viv Thomas and historian Dan Jewson attended the Utopia Fair at Somerset House London. Over the weekend, 35 representatives from contemporary utopian movements from all over the UK took up stalls and fill the courtyard, celebrating the pockets of utopia that are flourishing around the country from Newcastle to Cardiff, Sheffield to Scotland, Brighton to Doncaster plus a range of London sites. Presented in partnership with the Arts and Humanities Research Council (AHRC) and the Connected Communities programme, the Utopia Fair showcased the creative outcomes from 25 AHRC-funded projects, including the CAER Model Village Project, alongside 10 additional initiatives that have been hand-selected by Somerset House. These projects work to bring together local community groups, researchers, activists and artists across the UK to explore how utopian ideals can be used to benefit the environmental and social future of our communities. The Utopia Fair featured over 35 projects from around the UK – including the CAER Heritage Project. 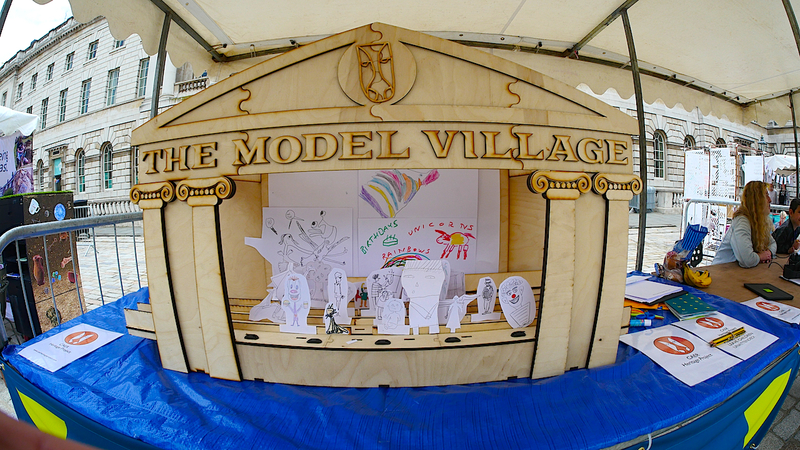 Young and not-so-young visitors to The Model Village stall were invited to design their own character or scenery to feature in our amazing Model Village Theatre – created in laser cut plywood by MAKERS Sheffield. The Model Village Theatre set created by MAKERS, Sheffield. Developing characters for our Utopian animations. They also worked on scripts for their characters. These characters were then scanned into iPads and imported into a user-friendly app that allowed them to create short, scripted animation sequences. 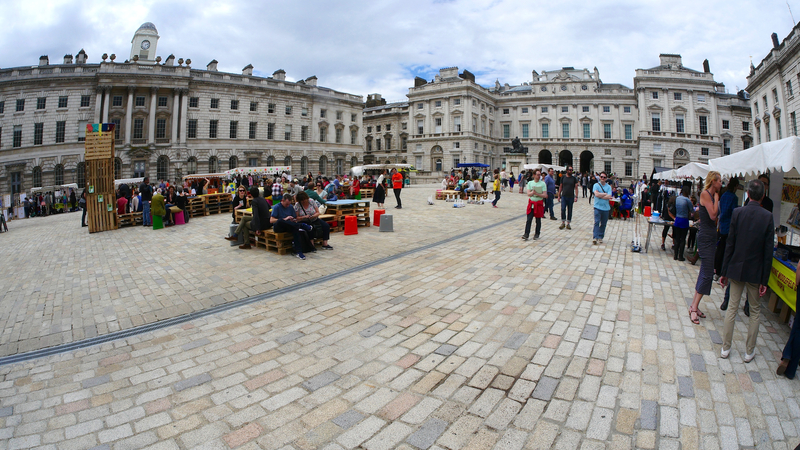 iPad photographs of Somerset House were used as backgrounds or scenery for these sequences. Dan Jewson helps our young visitors to create a short animated film sequence. In all over 15 animation sequences were created over the duration of the festival. The film that we developed during the early stages of The Model Village project (see Dusty’s First World War, The Model Village :: Part I and The Model Village :: Part II) also received a special screening as part of the Utopia Fair film programme. The Model Village film can be viewed here: HERE. Members of the team also had lots of fantastic conversations over the weekend and made some great new friends. Although we were very busy, and it was difficult to get round to see everyone, we especially welcome the connections that we made with the Life Chances Project and with our neighbours at the Middlefield Dig. The CAER Heritage Project team from left to right: Viv Thomas, Jon Harrison, Paul Evans, Dan Jewson. All photos © Viv Thomas 2016. 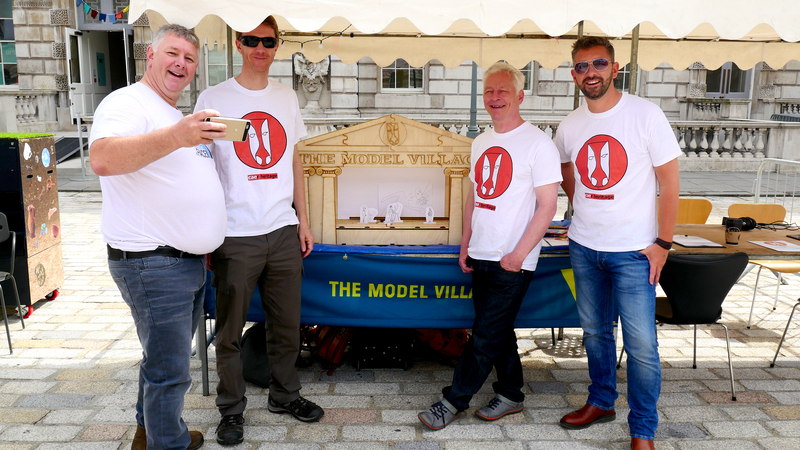 The second stage of The Model Village Project took place on Wednesday 15th June at Michaelston Community College, Ely – a short distance from the site of the CAER Heritage Project 2016 community dig at Michaelston Medieval Village. The young people, all from year 8, were given an introductory talk by Dr David Wyatt and CAER lead artist Paul Evans. During this they reviewed and reintroduced some of the topics dealt with in the first workshops at the The Glamorgan Archives (see Dusty’s First World War and The Model Village Part 1) along with an introduction to the concept of Utopia: an imagined community or society that possesses highly desirable – or nearly perfect – qualities. The young people then divided into two groups and group one set off to visit the archaeological excavation at Michaelston Medieval Village; to learn more about medieval life, participate in the dig alongside community volunteers and examine some of the finds. Meanwhile group two took part in a Medieval-themed version of the animation workshop that took place in The Model Village Part 1. 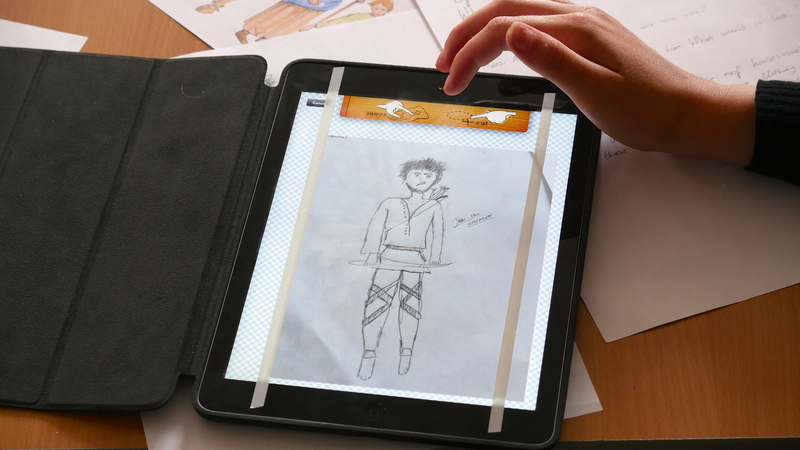 After a brief collaborative drawing exercise the young people developed their own individual cartoon characters – inhabitants for the Michaelston Medieval Village – and worked on scripts for their characters. These characters were then scanned into iPads and imported into a user-friendly app that allowed them to create short animation sequences. Photographs of Cosmeston Medieval Village, sourced from Wikicommons, were used as backgrounds or scenery for these sequences. Because of heavy rain the second group did not get a chance to visit the site, but this did give us time to give some serious thought to ideas of Utopia: what life might be like in a perfect world, and how Utopian ideas might apply to medieval villages – e.g Michaelston – or garden villages – e.g. Ely. The young people wrote some amazing reflections on their thoughts about this topic, which were recorded by Viv Thomas. One of these recordings has been used in the film; a beautiful summary/conclusion that helps reinforce connections between the substantial range of ideas explored throughout the project. Selected animation sequences from this workshop have been featured in The Model Village film, along with an interview with Dr Stephanie Ward made at the Glamorgan Archive, and film sequences from the Ely estate made by local film maker Viv Thomas and Jon Harrison. One of the many beautiful drawings of Medieval characters created during the workshops. You can check out the finished film HERE. Dr Stephanie Ward working with year 8 pupils from Michaelston Community College at The Glamorgan Archive. This is my first blog for CAER, and I thought it would be a good opportunity to introduce myself and our latest activities. I’m Steph Ward and am a lecturer in modern Welsh history at Cardiff University. I’m working with CAER Heritage’s Dave Wyatt and recent graduate Dan Jewson on a new CAER heritage project which is exploring the First World War history of Ely. Funded by the Arts and Humanities Research Council, ‘Dusty’s First World War’ is aiming to uncover the origins of the Ely housing estate and the history of the Dusty Forge. We are working closely with Michaelston Community College, Healthy Wealthy Wise, local artists, ACE and other community groups within Ely and Caerau throughout the summer and autumn. We plan to have a permanent exhibition at the Dusty of our findings and to remember the impact the Great War had upon the area. The Ely estate was originally designed as a garden village in the 1920s. Originating with Ebenezer Howard in the late nineteenth century, garden cities or garden villages were designed to bring together the best of town and country living. The rapid development of Victorian industrial cities like Cardiff led to often appalling housing conditions rife with overcrowding and poor sanitary conditions. Howard called for housing to be placed outside of the city, surrounded by plenty of green spaces for family and community recreation. The first garden village was established in Letchworth, Hertfordshire and was a wonderful example of spacious housing, large gardens and green spaces all within commuting distance of a major city. In Cardiff, the City Council bought the land on which the Ely estate now stands from Green Farm and Red Farm, developing its own garden village in the west of the city following the end of the First World War. The Ely garden village was therefore established as a model housing estate providing ‘the homes for heroes’ in the aftermath of this deadly global conflict. This is the untold local story that we want to explore in our project. 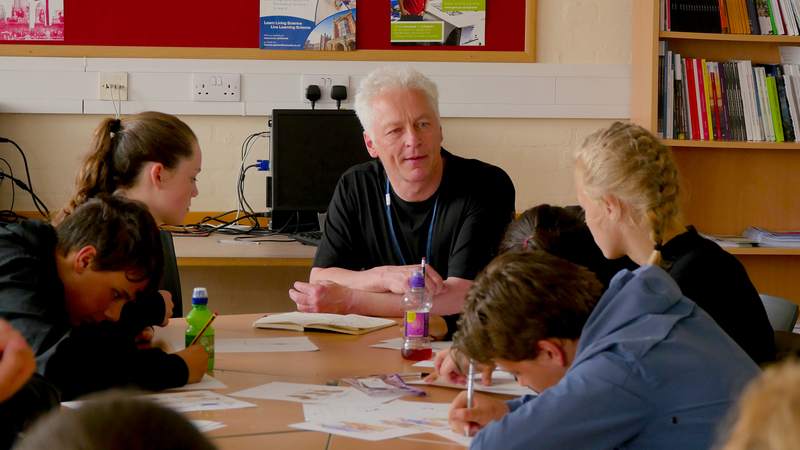 To get things going, in May 2016, we took a group of Year 8 pupils from Michaelston Community College to the Glamorgan Archives for a day of workshops and research into Ely’s origins. We had a very successful day with them, discovering how the Ely estate was designed as a garden village and thinking about the utopian ideas behind its development. The pupils studied the original plans of the estate and the architect’s drawings of the earliest houses. They then designed their own garden villages as utopian versions of Ely in a workshop with me. With Dan, the pupils role played as 1920s housing officers allocating families to new homes after the war. They also all had an opportunity to animate their own films about their findings with CAER artist Paul Evans and film-maker Jon Harrison. You can check out their film HERE. Role playing as 1920s housing officers with Dan Jewson. What was really interesting was how the pupils had a lot of ideas about how Ely has changed over time. 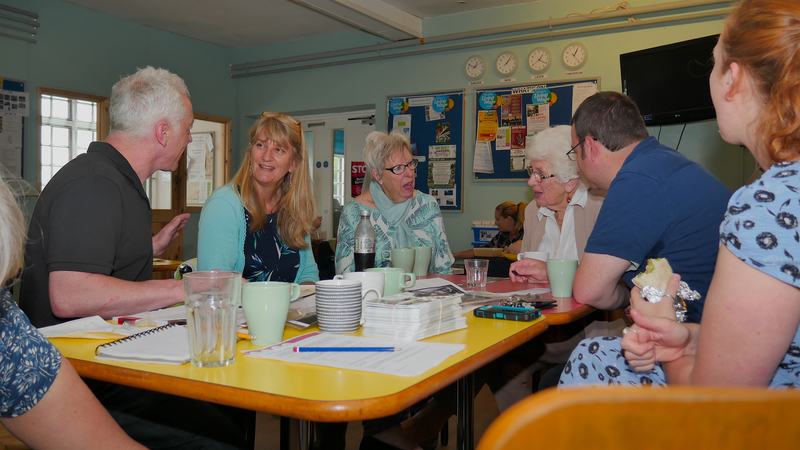 They were keen to discuss whether they think the principles of the garden village have survived in Ely and also about how they think their area could be improved. 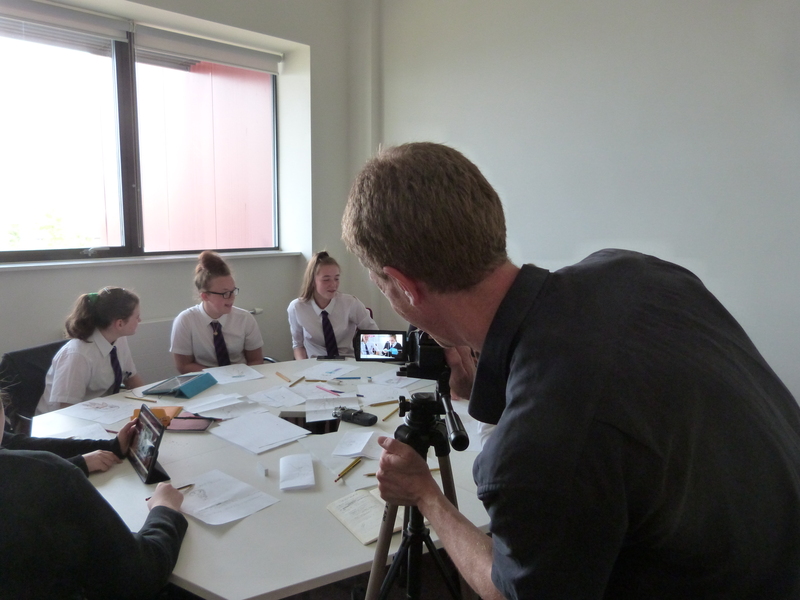 It really was a great start to the project and we are looking forward to working with the same pupils again in the autumn, when they will carry out an oral history project. Following our initial activities with the school, the Dusty’s First World War team’s next big initiative was to take a roadshow to this year’s Ely Festival and had a fabulous day there! We took along OS maps to show how the estate developed. We had loads of interest and input from local people who were willing to share their memories and who have lived, or whose families have lived, on the estate since the 1920s and 1930s– so if you visited us then THANKS! ‘Dusty’s First World War’ at The Ely Festival. The project still has lots to do, but one thing is already very clear: the people of Ely have a great sense of pride for the estate and feel very connected to their local history. We will be working to continue to uncover this hidden history of Ely over the summer, but we need YOUR HELP! Dan has planned a whole range of activities and we are looking for volunteers with memories and artefacts of the Dusty and the early housing estate. If you would like more information about how to get involved please contact Dan Jewson JewsonD@cardiff.ac.uk. Jon Harrison filming the Model Village workshop at The Glamorgan Archives. 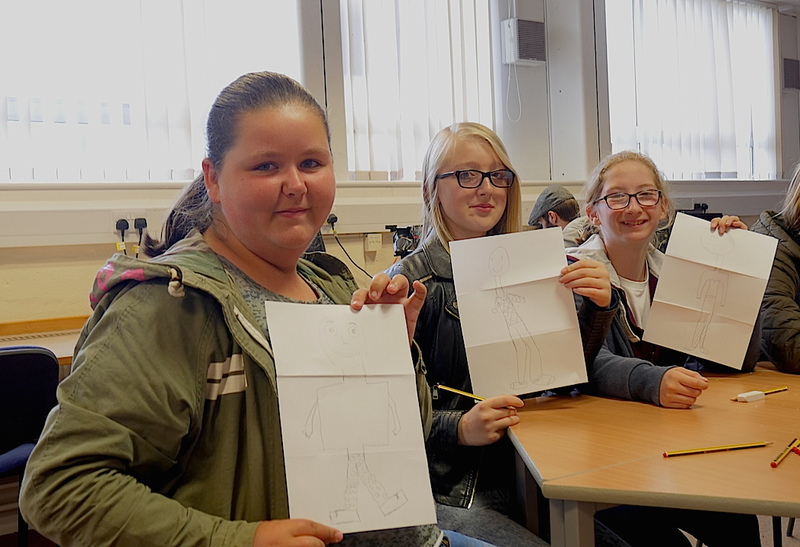 After a brief collaborative drawing exercise the young people developed their own individual cartoon characters – inhabitants for the Ely Garden Village – and worked on scripts for their characters. These characters were then scanned into iPads and imported into a user-friendly app that allowed them to create short animation sequences. Photographs from the Ely estate were used as backgrounds or scenery for these sequences. 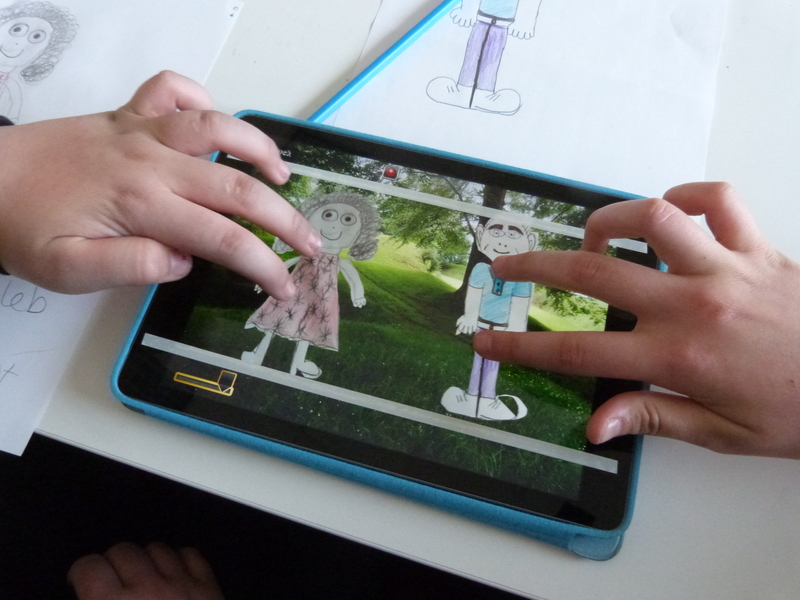 Characters designed by the young people are scanned into iPads to help create animation sequences. 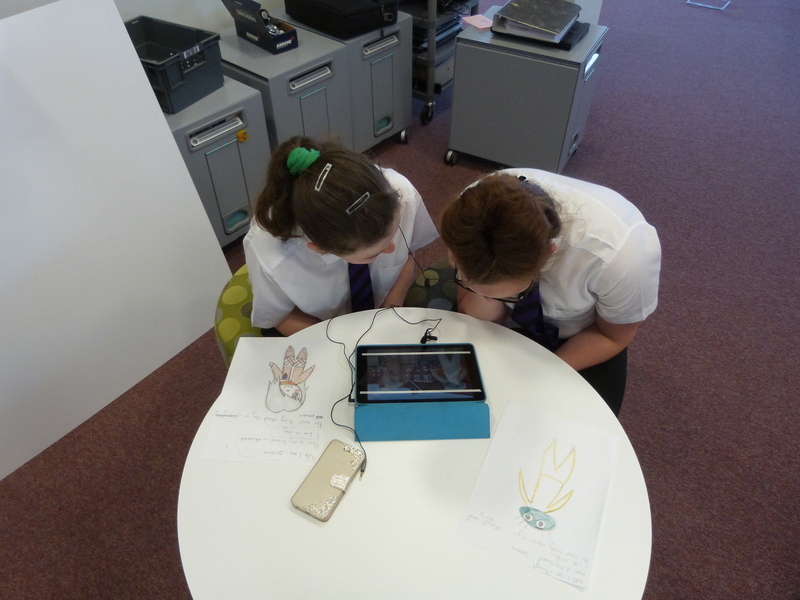 Working in pairs, the young people record and review their animation sequences.